Welcome to our Album of the Week. WHY: There’s nothing inherently revolutionary about the art of stripping. Songs. The art of stripping songs down to less flashy or fussy bits of their original composition. It’s an endeavor that’s never truly necessary, but when utterly well done those alternate incarnations can become a missing link that you never knew you needed. 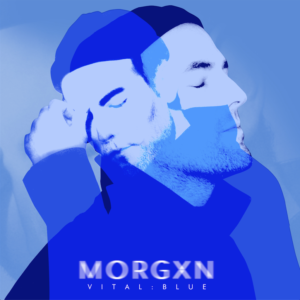 And that is what makes morgxn’s vital : blue (s t r i p p e d) EP – four songs from his 2018 breakout alt-pop album, vital, plus one new addition – such a rich sonic experience. The combination of his lyrical honesty, vocal prowess, and the thread of personal connection that runs from artist to fan has already placed him as one to keep eyes and ears on, but vital : blue (s t r i p p e d) is an unusually full-bodied thing of beauty. It’s such a thing because it bears different, yet no less compelling, fruit by taking his songs – those already immediate intimacies – and shifting them from dancefloor anthems into conversations that feel even more vulnerable, more open, more flesh to flesh. Piano, strings (the Orchid Quartet) and voice – including that of Walk The Moon’s Nicholas Petricca – are the only devices used and Petricca, in particular, is used to the fullest on the opening title track. “blue” sets a mighty high bar and tone that is ripe with a lush longing as morgxn and Petricca’s voices dance with and around each other. Every song’s appeal – already realized in their original form on vital – is given so much care that one could easily come to favor them over their original: see morgxn’s choice to wrap his fabulous tenor (instead of his falsetto) around “me without you” for the emotional seduction that it is. morgxn’s artistic stock-in-trade is simple: bearing his truth via songs and on vital he accomplished that and more. On vital : blue (s t r i p p e d), while musically scaled back, his truth is gorgeously magnified tenfold, almost to a point where the listening feels intrusive on his privacy. Let’s be honest: this exercise could have easily resulted in mildly interesting, if not downright dishwater dull reinvention attempts. But that’s not what we’re dealing with on vital : blue (s t r i p p e d) and the songs, morgxn’s fans and morgxn, himself, are all the better because of it.